"All Your People Made it. Fantastic. Another check mark under W for you. You're a great coach.  Lindy S.
​Best Attended Century in Southern California. 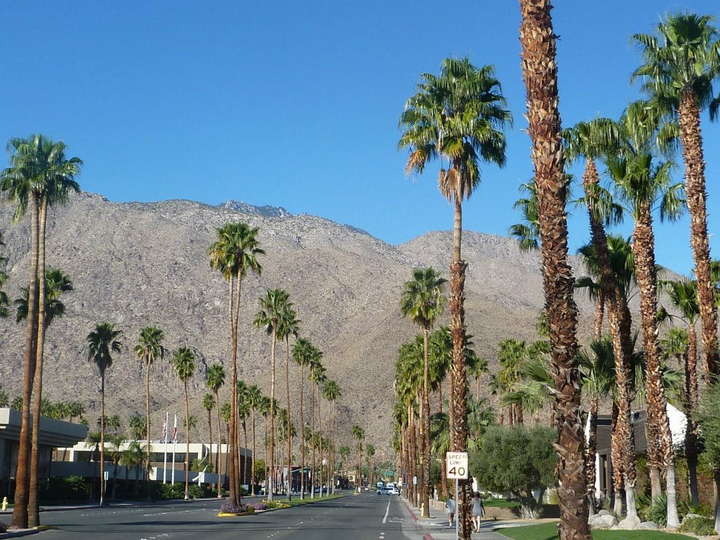 The Tour de Palm Springs is one of the best centuries in the country. Palm Springs weather is ideal in the winter. Coach Darryl finished the first Tour de Palm Springs in 1999 and has completed it 16 times, benefit from his knowledge on the event! The route is very flat for 100 miles with only about 3,100 feet of climbing. There are no hills that are as long or as steep as Torrey Pines. Prefers to ride an event that is very flat with no energy robbing climbs, is well supported and normally has great weather. Wants to save money by taking advantage of Coach Darryl’s Hotel Group Rate and ride fee discount. Training rides will be the 5 weekends before the Tour de Palm Springs. Distances will gradually increase for each of the training rides. On-the-bike weekend road training for around 415 miles and 30 hours of coaching over the five weekends before and the weekend of the Tour de Palm Springs, weather permitted. Palm Springs 'Locator Sheet' for all event and social locations. Detailed route description sharing Coach Darryl’s 14 years of TdPS. Garmin route to use while doing the event. Energy saving Century Team group riding to allow cyclists behind to draft off those in the front to save energy. Two-up non rotating paceline of fellow Century Team riders to provide a draft for conserving energy while both training and pedaling the event. Riding 2-up also allows each Century Team member to talk with the adjacent cyclist to provide a much more pleasant cycling experience throughout the hours on the bike. ​The Century Team target will be to complete the Tour de Palm Springs averaging 14.0 miles per hour in 7.5 hours at around 3:20pm. One year we finished just 9 minutes off our target. Can you pedal a 40+ mile ride at 13 MPH for a flat ride or 12 MPH for a hilly route? If so, you are a good candidate for the Century Team. Century Team cyclists share working or pulling at the front of the group. Only two riders are pulling at any time, therefore for a group of say 20 cyclists, 18 are resting while only 2 are working. Stronger riders pull for more minutes at each turn at the front, they do not pull faster they pull farther. Riders who are not as strong pull for fewer minutes or not at all. 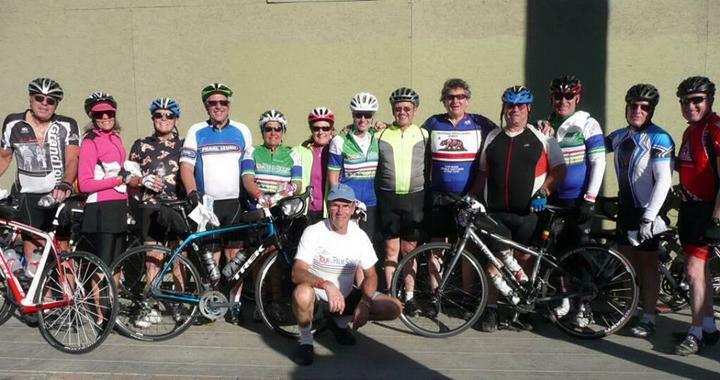 Cyclists increase their group riding skills when training with the Century Team! 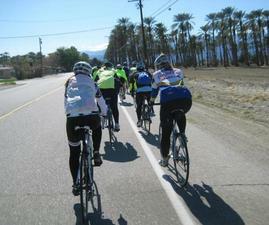 Each cyclist must complete at least 3 of the 5 training rides to ride with the Century Team at the Tour de Palm Springs. Get on the Interest List for the 2017 Century Team now to get the first information and option to register. The number of cyclists on the Century Team is limited. "You really did have a professionally trained group…rock solid!" "It was a wonderful experience being coached by you and training with the team. I am well on my way to overcoming my fear of riding in groups and I am confident that the more I do it, the easier it will be. Thanks again for all of the tips. I know they made me a more confident and better rider." "I just wanted to say thank you for all the great coaching. You have the patience of JOB! Also, you have this wonderful demeanor that puts me right at ease. You treat all of us as individuals and seem to somehow have figured us all out in such a short time! I just wanted to send you an email note of thanks and to tell you that I really have appreciated your coaching - no need to write back or anything. I look forward to seeing you on Tuesday. In reflecting on the ride and the training leading up to it I want to thank you for your gift. I am a much better rider now. I am more cognizant of the riders around me. I am stronger. I am more aware of the surroundings and of what to do in a variety of conditions from wind to rain to extra dry, etc. I am a safer rider and have grown by leaps and bounds in terms of endurance and strength. You are the gift that has made this all possible and I want to acknowledge and thank you for it."